A Schedule, some more info, a winner and normal blogging. So I want to start by asking those who come here for the blogging, and not for the event, to hang in there. Posts have been a little light on the ground - which is due to all the work that needs to go on to get this retreat thing up and running - AND some normal life things like school holidays and unthought-out overcommitment*. So the Workshop Schedule is up. I have tried to make it as unconfusing as possible but if you want to ask questions the please ask in the comments of this post. That way everyone will be able to see the replies. I really hope the things you totally have-to-have-to do don't clash, and that there is enough depth and variety there that if they do clash, that you have other choices. I've tried to spread the different disciplines across the two days so you will have plenty to choose from. Sometimes when you are creating an event like The Craft Sessions Retreat, there is the odd bit of a smoke-and-mirrors kind-of game you need to play, to get everything up and running. Especially, as is the case here, when this is a do-it-in-our-spare-time gig, as it is for most of our teachers. So, why am I telling you this? Because I want you to have a look at our Intro To Lace class - I totally love love love lacework - but I've only ever made a couple of lace shawls in my life. Mainly I use lace as an edging on something or as a panel (like the Frost Flowers motif seen in the gorgeous Immie Tee's below) or even in the baby blanket which you see at the top of the post. Even if you think that lace shawls aren't for you, I wanted to explain that in our lace class, the lovely Ophelie is writing a pattern that is incorporating the Frost Flowers pattern (which is the panel in the tee below) into a beautiful shawl or scarf. In my opinion, Frost Flowers is the most beautiful lace motif ever which is why we wanted to design a class around it. I just don't have photo of it yet as the pattern is still in the works. So in the mean time go and have a look at Carrie's gorgeous cowl here for some inspiration. We aren't using her pattern as it is a bit too Frost Flowers intensive for a beginner class but we totally adore it. Work created by the incredible Siobhan in last year's Embroidery from the Natural World workshop. Another thing I wanted to let you know was that we have TWO separate Embroidery classes. We have Embroidery From The Natural World (which has been one of the most popular classes for the last two years!) AND then this year we also have Embroidery 101 for those people that want a bit less of a freeform class, a class that is more directed. You will be using transfers in this class and working more closely with Melissa to make a project bag. I need to stress that the gorgeous super lovely Melissa won't be teaching in 2016 as we need to mix the classes up some more so if you want to take a class with her then this is your chance. And you do want to. She is ace! 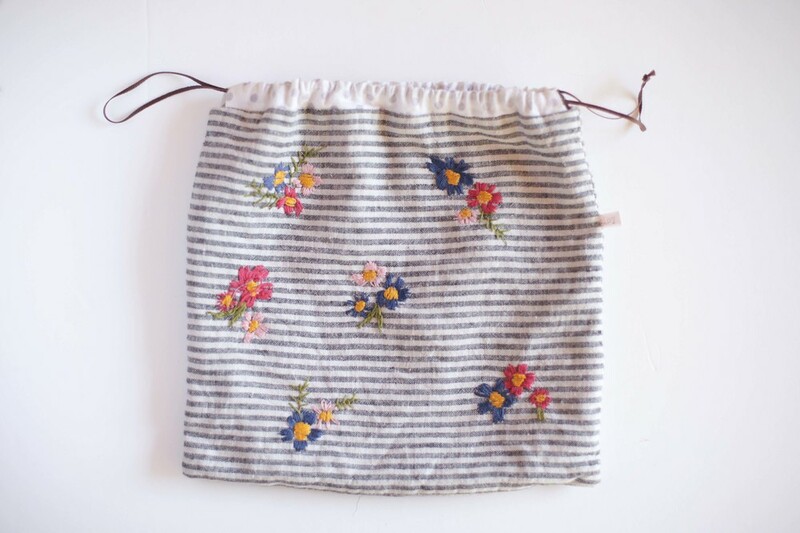 Create one of these embroidered project bags in the Embroidery 101 workshop. So I'll be telling you more about these later in the week - but they are pretty spec-bloody-tacular. For those of you that haven't been before, we have "free" time on the Saturday afternoon. Now if you are the slow moving type you might like to sit around and craft in that time, chat around the fire with your new friends, go for a walk in the bush, or do the restorative yoga class. However, if you are more of a "I love a class, as many classes as possible please" type, you might like to try our one hour "extra" classes. You don't need to tell us you want to do these, as there is no class size limit, so if you want you can even decide to come to the these on the day. A Spinning Demo and Q&A - with Judy and Kate. These classes are just icing on the cake for me - and I hope they are for you too! Finally I wanted to say a big big thank you to all of you who left lovely comments on the blog post about which classes you wanted to do. I loved reading what you were excited about. The winner of the giveaway was Karen Tsutsumida. Yay Karen! I'll email you directly to get your address. Chat very soon - we will get back into the normal blogging rhythm soon I swear. *OK so normally I just talk The Craft Sessions in this space but this is a fantastic event and for a good cause! One of the overcommitments I've made is that Jenn and I have organised an ace fundraiser for a local kinder**. We have dragged renowned author Steve Biddulph across the Tasman to come and do two different talks in the next two days. If you are in the north east of Melbourne around Eltham or Templestowe way and are a fan of Steve (and who isn't?) then there are a few last minute tickets available. He is speaking about The Road To Manhood on this Wednesday 15th at 7.30pm and then on Thursday the 16th Steve is presenting The Secret To Happy Children, again at 7.30pm. We would love to see you there. **The real question is why I would choose to arrange a fundraiser AND launch the retreat in the same week..... that was the unthought-out (and unclever) part ;).